What Is the Bronze Plan? The Patient Protection and Affordable Care Act, AKA Obamacare, offers 4 insurance plans called Bronze, Silver, Gold, and Platinum. In a 2013 survey only 4% of Americans understood the difference between the plans, one of the most important facts of the new plan is all plans must cover the same Healthcare Exchange essential benefits, however each state and/or provider may offer additional or extended benefits. The Bronze Plan is set up to have the lowest monthly premium of the 4 new categories of plans*, with the highest out-of-pocket costs (combination of deductible, copayment, and coinsurance). *There is also Healthcare Exchange Catastrophic coverage, available to those who qualify. How do Bronze Plans work? The following information below is for individual and family members. Click here to learn about how the Bronze plan works for Small Business owners under ObamaCare. Lowest monthly premium (without subsidies). Do I qualify for Healthcare Exchange subsidies? *These rates are based on California figures. To learn which plans are available in your state get an exchange quote or call 800-930-7956. Is There Only One Bronze Deductible? No, Bronze offers different plans with high and low deductibles (the amount you pay before your insurance kicks in) and different amounts of co-insurance (% you pay after deductible is satisfied, and before out-of-pocket max is met). 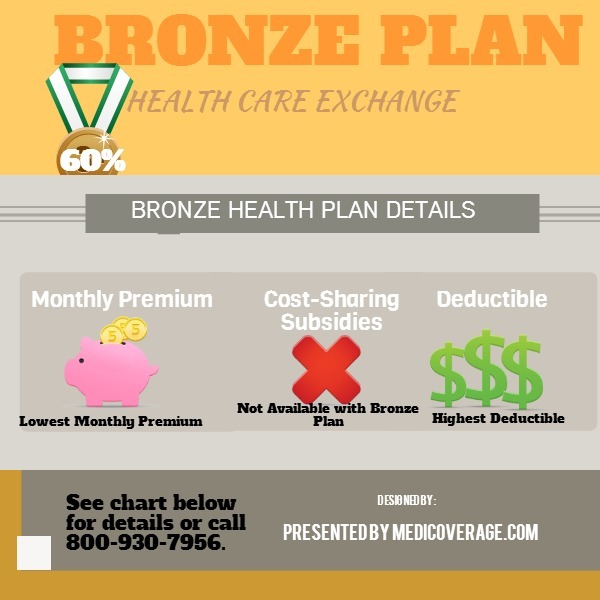 Remember, regardless of the deductible, all Bronze plans will ultimately equal that 60/40 split. Just a reminder that people over 65 do not have the same options. Click here to learn more about Seniors and the Health Care Exchange. How Does the Bronze Health Plan Compare to the Other New Plans? Basically Bronze will cost you the least each month but you will pay the most in shared costs should you get injured. Click here to compare Bronze Plan, Silver Plan, Gold Plan, and the Platinum Plan side-by-side. For any questions or assistance in applying, please contact Medicoverage. If you’re ready to apply click here to get your Exchange application. How is mental health paid on the Bronze Plan? Does the deductible apply and if so, how much? Also if it’s paid at 60% 60% of what? Thanks for your questions. Bronze plans vary from state to state so there is not one right answer. Mental health is usually covered once you paid your deductible. You can see a mental health specialist before you have paid your deducible but you will have to pay the doctor your plan’s negotiated rate first. Depending on the insurance provider, you may still have to pay 40% of the doctor fee even after you satisfy your deductible. Call 800-930-7956 for help with specific plans. If you have a $5,000 deductible, the insurance does not kick in until the $5,000 deductible is satisfied. TRUE ? I read in the NYT that the maximum out-of-pocket medical expenses of $6,350 for an individual and $12,700 for a family have been postpned until 2015. TRUE ? Thanks so much for your questions. Depending on which plan you purchase, your insurance benefits may not kick it to pay for covered expenses until till after your deductible is met. Out of pocket Maximums (OPM) can vary but the Bronze, Gold and Silver typically have $6,350 OPM for individual and $12,700 OPM for family. As far as we can tell from the NYT article and the states we represent, the change in the OPM should only affect group insurance. But as you can tell, plan specifics are still being clarified. We suggest giving it a little time to settle before you enroll in a new plan. Don’t forget you can enroll in an ACA plan until December 15th for a January 1st start date. Please give us a call at 800-930-7956 and we would be glad to help you sign up. This is really helpful. Only thing is how much will the monthly premiums be for this plan?